Tom loves meatballs. I’m not a fan of ground beef. But when we work together, beautiful things happen. Beautiful things like these orbs of deliciousness you see above. You might expect meatballs made with turkey to be bland and dry, but these are neither. Panko breadcrumbs keep them light, minced onion keeps them moist, and parmesan adds flavor. I’ve served these here with tiny potatoes and roasted broccoli. They’re great over egg noodles, or with biscuits or popovers to soak up the sauce. And that sauce! It’s deceptively simple, just chicken stock with a little sautéed onion and garlic, thickened with a flour-and-butter roux. But when you add the browned meatballs and simmer, the sauce becomes silky, golden and deeply flavored. These are easy to freeze and reheat. I usually make a double batch and freeze half. They made a recent appearance as appetizers, stashed in a slow cooker with an egg cup full of toothpicks nestled alongside. In a bowl, mix together the turkey, panko, 1/4 cup of the minced onions, garlic, herbs, parmesan, salt, and pepper. I use my hands; it’s easier. Roll the mixture into whatever size meatballs you prefer. Set the meatballs aside for a moment. In a medium saucepan, melt the butter, and sauté the remaining 1/4 cup of the onions with the garlic until the onions are lightly browned, about 5 minutes. Add the herbs if you’re using dried. Stir in the flour and cook for 2 minutes. Whisk in 1 cup of the stock and boil for 2 minutes until thickened. Reduce to medium-low and simmer. Add fresh herbs at this point. Heat the oil in a large skillet over high heat. 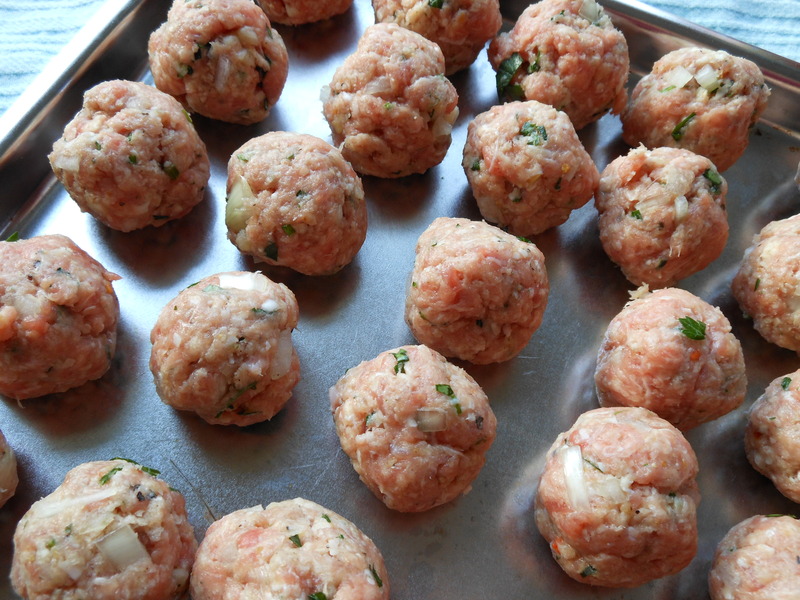 Add the meatballs in one layer with a little space between them; this may mean you work in batches. Brown the meatballs very well, rolling them as they brown to get some good color on all sides. Don’t worry about cooking them all the way through. Once the meatballs are well browned, gently drop them into the simmering sauce. Pour the remaining 1/2 cup stock in the skillet and stir to deglaze all those lovely brown bits left over from the meatballs. Pour the stock into the saucepan with the meatballs. Simmer for at least 15 minutes. You’ll get the best flavor if you simmer on low for a half-hour. To freeze: After the meatballs have browned, set them on a tray in one layer to cool, then place the tray in the freezer for an hour or two. As soon as the meatballs are solidly frozen, transfer them to a ziplock bag, and leave in the freezer for up to 6 months. You can make the base sauce ahead of time and freeze that separately. I just deglaze the meatball skillet with a cup of stock and freeze that, then use that as the base for creating the sauce when I’m ready to use the meatballs. 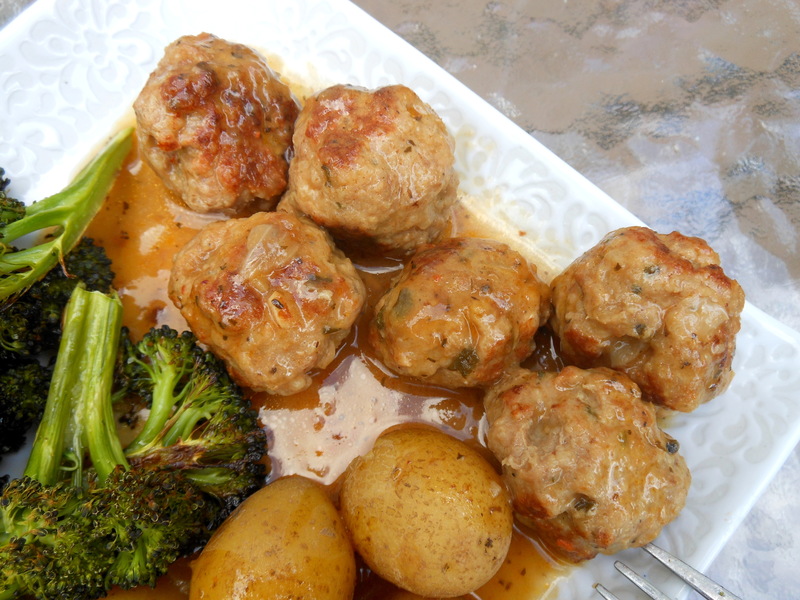 Remember that the frozen meatballs are not completely cooked through, so you will need to finish cooking them before serving. This entry was posted in appetizers, main courses, meat, poultry,and fish and tagged ground turkey, healthy, light, make ahead, meatballs, panko, turkey. Bookmark the permalink.